Turkey Cutlets with MushroomsThyme for Cooking quick, easy recipes. 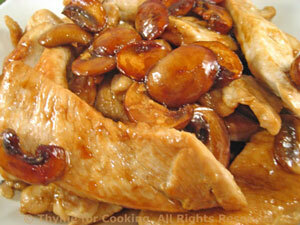 Thin turkey cutlets cook so quickly, I cut these into strips and stir-fried it all. Cut turkey into large strips. Heat oil and Teriyaki sauce in a large nonstick skillet. Add mushrooms, toss to coat thoroughly, and sauté until browned. Add turkey strips and stir-fry until cooked through. Add sherry, stock, peanut butter and stir until well combined and sauce coats turkey and mushrooms.